I'm looking for a cheap set for my CC01 will be used for both rally and crawler set ups. I want a waterproof type of brushless esc and motor. 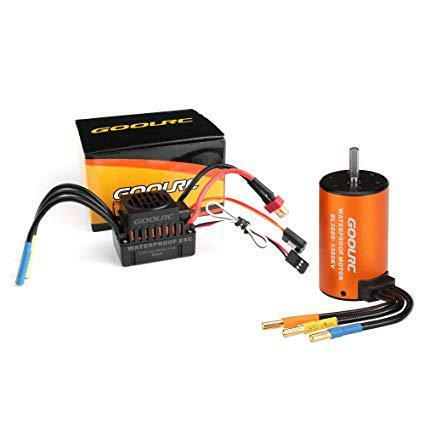 I saw a couple of GoolRC combos and they are cheap! Ranging from $30 - 50. Has anyone tried this? Would you guys recommend 45A with 3000KV or 60A with 3900 KV? I thought it's a rather popular setup. I'd go with the 60A ESC. 13.5t is about the limit of 60A ESC. And 13.5t is often translated into 2800kv to 3300kv. Which means 60A would bottle-neck at around 3300kv. However, this set uses a fan. That reduces the overheating. Which is why you see 60A ESC mated with 3600kv or 3900kv. I got the 3900 Kv and 60A as a spare for my Himoto (B4 clone). Super easy to set up. Hard to beat from a value perspective. Haven't used it enough to determine longevity. I'd recommend the 3900/60A option, not sure how accurate the ratings are on cheap gear. Thanks for the info. Will definitely check the motor size first. Although I'd use this for crawling and not-so-fast rallying, so I guess an equivalent to 23t is quite enough. Nice to know that. Thanks. Now I'm convinced even more. By the way, what size is the motor? The shaft diameter says it's 3.175mm. You say it is for crawling? Presumably you mean slow speed driving over rough obstacles? For such driving, good throttle control at low speeds is highly beneficial. Good throttle control at low speeds is an area in which budget sensorless motors do not excel. You may be better served with a sensored brushless setup or a traditional brushed set up. Yes crawling and rally at the same time. We have some local rally races with 1/10 SUVs here. So I would also like to try that. Installing a slow motor would really put me in the last place. Hahaha! But seriously, I'd also like to try crawling. Basically, this kit will be used mostly for bashing and driving around almost anywhere I can.